I stand firm on my conviction that one grilled cheese is never enough. One plain grilled cheese, made with regular bread (whatever the heck that may be) and a side of pickles always leaves me wanting more. Like more in the sense of an entire second grilled cheese. Or at least three fourths of one. I’ve pimped out this belief on the facebook, the twitter and the instagram for years now with pictures of my drippy, crunchy sandwiches. It’s just making it’s way here. Sidebar: how grossed out are you right now that I not only dip my grilled cheese in ketchup, but also in residual pickle juice? It’s fine. Go ahead. Judge me. This is an example of how I make one grilled cheese be enough for my high maintenance appetite. Stuff it full of things. All the things. My parents have been legitimately obsessed with ordering fried zucchini since, like… the 90s. Maybe even earlier. No matter where we end up, it’s always an appetizer. Sometimes it’s completely delicious. Sometimes it’s disgusting and tastes like every other thing that’s been in the deep fryer since last Friday. It just depends. I’m over it. The thing is that even though my family has funded zucchini farmers everywhere (that’s not even a little bit true, I know), my earliest memories of “fried” zucchini came from my mom making it in the summer with the garden-fresh green stuff. She never truly deep fried things, but instead just added a few tablespoons of oil to her cast iron skillet (which is maybe 60 years old now?) and cooked it until crispy. It was incredible… because my mom? She is quite heavy handed on the parmesan. Now you know where I get it. I really wanted to call this fried zucchini grilled cheese but I thought you might throw something at me. 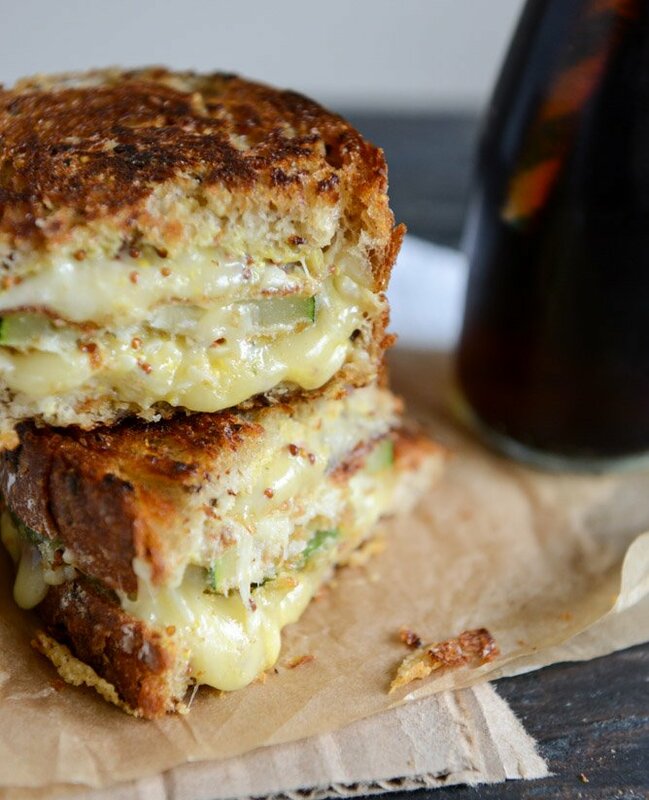 Fried stuff inside a grilled cheese? Whaaaaaaaat. How are we even friends. But but but – you can BAKE the crispy zucchini (on a wire rack, just like how I did the chicken yesterday) and use whole wheat bread and well, there you have it folks: HEALTH FOOD. Whatever is easier – bake this or fry it in a little olive oil – just eat it. I’m still flipping out over all things aioli too, so… ugh. What a freaking delicious nightmare. Prep the aioli first (recipe below). In a bowl, whisk together the egg and egg white. In another bowl, whisk together the panko, breadcrumbs, flour, parmesan, salt, pepper and garlic powder. Heat a large skillet over medium heat and add olive oil. Dip each zucchini slice in the egg mixture to coat, then dredge through the breadcrumbs, pressing gently to adhere. Place in the skillet and cook until golden – about 2 minutes per side. When finished, remove the slices with kitchen tongs and let drain on a paper towel. Spread one side of each bread slice with softened butter. Heat a skillet (I used the same one, just wiped out) over medium heat and place bread buttered-side down, then top with a spoonful of aioli, a handful of grated cheese, a few zucchini slices, more cheese, more aioli, and the second slice of bread, this time buttered-side up. Cook until cheese is melted and both sides are golden brown – at least 5 minutes per side. Lower the heat if the bread gets too brown. Serve immediately and dip any extra zucchini slices in the leftover aioli! Whisk together dijon mustard, egg yolk and lemon juice in a large bowl until combined. Slowly stream in olive oil while continuously whisking until the mixture emulsifies and comes together completely. Whisk in whole grain mustard and horseradish, then taste and season with a little salt and pepper as desired. Set aside. This work is worth it. Swear. Crunchy Coconut Chicken Fingers with Peach Honey Mustard. Okay first off, I have a MAJOR obsession with cheese, a one track mind when it comes to cheese, this looks absolutely scrumptious! It makes me think of a grilled cheese in a restaurant in my hometown. The restaurant is known for its burgers, but I almost never get a burger. I’m all over the grilled cheese! It’s made on sourdough, filled with really nice fiscilini farms san juacin gold (a type of cheddar and also has lettuce tomatoes and bacon. I think you’d love it, but this just looks so amazing! I have to fix it for my fiancé for dinner tonight! He’ll be diving in to be sure! Oh my. I can actually hear the crunchy noise that this sandwich will make when I bite into it and I’m getting giddy. I have a loaf of homemade sourdough in the freezer that’s begging to be grilled with all of this goodness. Yumm and thanks!!! Totally decadent use of a vegetable; and I’m onboard. Love at first sight! Have to make this! Definitely a good way to get some veggies into my hubby lol! Aioli is garlic mayonnaise; it’s what the word means. This is closer to tartar sauce. Yes, this means the Diva is wrong too. Pingback: What I'm loving this week! And this is amazing! Crispy zuc with melty cheese. i jsut made it my mission to go out and get some bread, or maybe try making it at home! Just got a box of Panko, made homemade bread dough, and picked 2 zucchini… sounds like the perfect recipe for me! The zucchini is just starting to come in and this would be a great way to enjoy some! Oh wow, this sandwich is perfection! So beautiful and so delicious, I need this now! Oh my goodness. Need to try this… even may consider adding avocado… too much?!? Hi Jessica! I somehow just found your blog and have been reading backwards like a crazy person from present to this post all night. Just wondering, have you ever been to/heard of the Pop Shop in Collingswood, NJ? Check out their grilled cheese menu. Anyway, thanks for the great blogging! Okay so I just made these and they were AMAZING!!!!!!!!!! such an excellent flavor, and I made butternut squash soup to go with it. Thanks for this!! Hey, I love dipping grilled cheese in ketchup too! Almost everyone thinks I’m so strange, glad to know I’m not alone! We also grew up putting mac-n-cheese, hamburger helper (gross, yeah), and spaghetti on top of peanut butter toast. I’ve gotten my hubby to try it (minus the nasty helper stuff) and he admits it isn’t bad! :) This looks delish! All I can say is OMG! I never made aioli before. This was the bomb! My taste buds exploded. We uses mex cheese, parm and mozz for the sambo because that’s what we had on hand. So flavorful. I felt like I was eating a juicy Reuben. Sure, gained 10lbs probably but hey, so worth it!!!!!! Vegetables in breadcrumbs and cheese between bread and cheese? Crazy. Excellently, deliciously crazy. This look incredible, what brand of bread did you use for this masterpiece or was it homemade and if it was can you share the recipe. I am a firm believer if you don’t have good bread a grilled cheese will never be as amazing as it should be. Thanks for posting. I am vegan so I think I’ll try this sandwich on a good french bread with no chees!